Daily with several departure times to choose from. If you're lucky enough to do this trip on a hot Summer's day it's a great way to cool down! We are comparing River Thames High-Speed Cruise from Embankment Pier Prices from leading ticket suppliers and Try to find you Cheap tickets prices on the market. 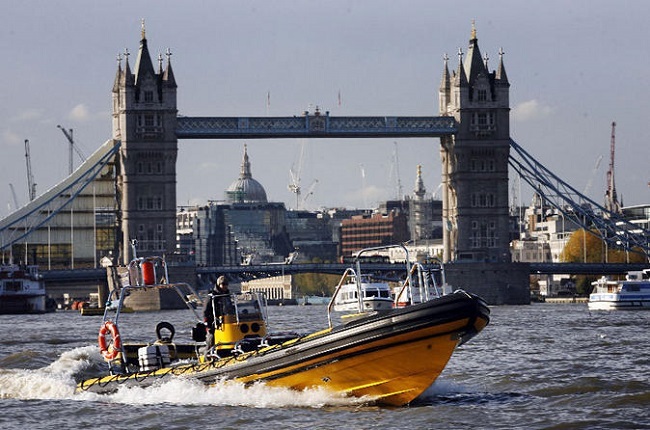 An RIB boat is a rigid inflatable speed boat that, on this Thames river cruise, will reach a speed of 50 knots. It's kitted out with a state of the art sound system so you can get pumped up with the James Bond theme tune whilst also listening to live commentary about the places you're passing. Limited to 12 passengers it's an unforgettable way of seeing some of London's most iconic riverside sights and since you're provided with wet-weather gear you don't have to worry about coming back with soaking wet clothes! A boat trip for the adventure seeking adrenaline junkies! A fun and memorable way of seeing London fast! Good for fun-loving families but kids must weight over 15kg. Your Experience With River Thames High-Speed Cruise from Embankment Pier? Meeting at Embankment Pier you'll be kitted out with high quality wet weather gear (as needed) and given a brief safety talk before taking your seat in the rigid inflatable speed boat. You'll start off slowly, cruising past some of London's top attractions both old and new including The Shard and St Paul's Cathedral as you listen to the live commentary describing what you're passing and giving you some fun and informative information. Then, once you're under Tower Bridge, the fun begins and the race is on as the throttles are pushed to the max! You'll suddenly find yourself speeding along at 50 knots to Canary Wharf on the adventure of a lifetime. With James Bond music playing your heart will be beating fast as the adrenaline races around your body on this epic speedboat tour of London. This is action adventure at its best - Enjoy! What River Thames High-Speed Cruise from Embankment Pier Includes? Best not to eat straight before the trip in case you get sick! Let the crew know if you're celebrating a birthday and they'll play Happy Birthday for you as you cruise back in. Travelers Reviews about River Thames High-Speed Cruise from Embankment Pier? People talking about this tour on Trip Advisor, Get Your Guide, and Viator give it top ratings and, for the most part, really fantastic views - You can never please everyone!! People describe it as "Thrilling! ", "Brilliant", "Exciting". They have said it's a "Must Do" and "Top Entertainment" that's "Worth Every Penny". Everyone agrees that the commentary is hilarious and that the crew really make this trip and know how to handle the boat for the safest and most enjoyable ride possible. You must agree to the operator's terms and conditions before taking part. You need to arrive at the kiosk on the pier 15 minutes prior to your departure time. Departing from Embankment Pier, Victoria Embankment, London WC2N 6NU.